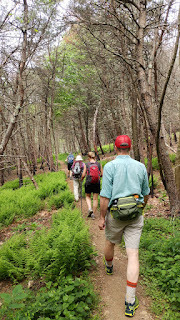 A group of five hikers led by Barbara Martin enjoyed a great hike to Cole Mountain Saturday. Sunny Choi, Nancy Handley, Paul Henderson and Marian Styles beat the rain to the glorious views at the top of Cole Mountain. 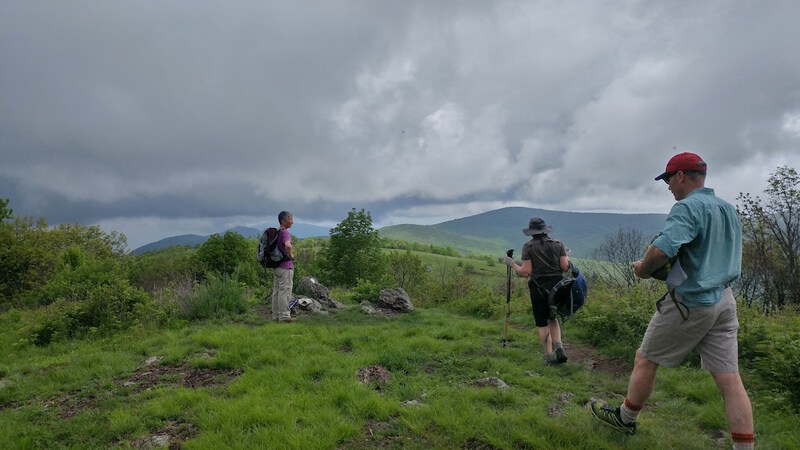 Mark Perschel stepped in to lead the Love Gap - Mau -Har Trail hike on May 5 because Marit Anderson had to tend to her ailing mother. He was joined by seven hikers including new comers Ivan Via and Karen Ballen, along with Nancy Handley, Iva Gillet, John Sinclair, Betty Joyce Nash, and Dave Borszich. The group met up at Love Gap at MP 15.5 on the Blue Ridge Parkway after some car pooling segments. The group started on the fire road and headed in to unite with the Mau- Har Trail at the Maupin Field Shelter. The seven mile hike continued down along Campbell Creek for lunch and then a long haul back up the mountain to return to the parking area. Elevation gain was 1180 feet. The previous week Marit and Mark prehiked the route and the wildflowers shown below were from that excursion. There were reports that it was a great day to be out in the Three Ridges Wilderness enjoying the falls, wildflowers, and nice weather.